I am looking for some type of plugin or code which would allow me to add a geojson URL, define the areas to input the lat/long variables from the visible Qgis canvas map and call/render the results within Qgis. Anyone know how to do this? You'll have to add the bounding box to the query manually if necessary. 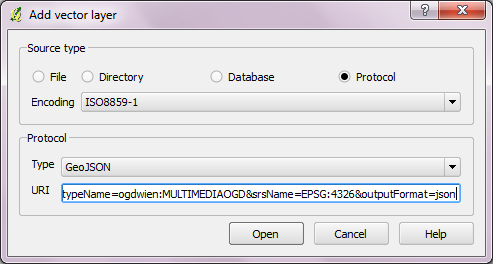 It's also not difficult to import GeoJSON into QGIS. For an example covering point geometries see "Tweets to QGIS". Not the answer you're looking for? Browse other questions tagged qgis geojson json or ask your own question. Render GeoJSON and GML formats? How to measure correct distances in a project with OpenLayers background?